The reality of RoHS Compliance is that while relying on vendor submitted data and documentation is helpful, pointing the finger to them is no excuse if a 'non-compliant' product from you ends up on the market. The extra layer of protection that in-house screening through XRF technology presents is preferred by many organizations looking to limit potential issues by verifying that vendor data is accurate. X-Ray Fluorescence (XRF) Technology is a proven solution for organizations that prefer in-house testing and Quickshot XRF offers both handheld and desktop instruments to meet the compliance regulations. 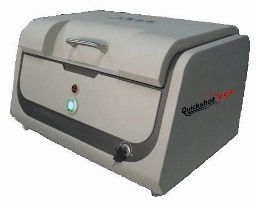 Quickshot XRF systems offer streamlined software that is simple to use in obtaining accurate results and creating the proper documentation. Additional benefits of XRF are that it requires limited (often no) sample preparation and offers fast measurement times. The Handheld XRF Analyzer (QSX-HH) is popular for its portability, pricing and that it is not limited by sample size. Quickshot XRF's new desktop analyzer (QSX-82D) was developed specifically for RoHS analysis and provides an extremely streamlined software package with great report functions (including a camera image) and is an excellent solution for analysis of smaller electronic components. What is the right in-house testing method for your organization? Both handheld and desktop x-ray fluorescence analyzers can meet your testing interest and the different benefits each offers is what will make one the better fit for your organization. Review this XRF Blog entry to learn more about what each system offers to help determine which is the best option for you. The European Unions (EU) 2003 directive on the restriction of using certain hazardous substances in electrical and electronic equipment is commonly referred to as the Restrictions on Hazardous Substances (RoHS). This regulation on heavy metals took effect in 2006 and restricts the use of six hazardous materials in the manufacturing of electronic components and related goods that are sold into the EU. Developed to limit the amount of toxic ‘e-waste’ put back into the environment; the regulation was designed for the European Union member states and affects companies that sell into them. In addition to affecting companies selling into the EU, many other countries and states are developing similar hazardous substance regulations – Asia has China-RoHS and California has developed the EWRA – so proving compliance is critical to insure continued business across a wide range of locations. The recent recast of the regulations, known as RoHS2, has created the need for compliance testing by a new portion of industries that are now affected by the regulations - including medical devices and monitoring/control instruments. Worth noting is that the term 'producers' has been removed, making the recast applicable to manufacturers, importers, distributors...down the supply chain. The maximum permitted concentrations are measured in parts-per-million (ppm) by weight of homogeneous material. This means that the limits do not apply to the weight of the finished product, or even to a component, but to any single substance that could (theoretically) be separated mechanically—for example, the sheath on a cable or the tinning on a component lead. Everything that can be identified as a homogeneous material must meet the limit. So if it turns out that one material part of a product has 2,300 ppm (0.23%) of a regulated material then the entire product would fail the requirements of the directive. ...we look forward to providing the solution.